For homeowners, we design and install home theaters, whole house & outdoor music systems, home wired & wireless networks, Lutron systems, and we also program products from Universal Remote Control. For businesses, we design and install digital signage, HDTV displays, conference room audio/video presentation systems, and multi-zone music systems for offices, showrooms, and restaurants. 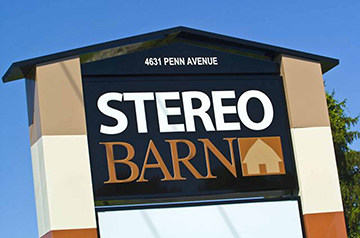 Since 1971, Stereo Barn has helped over 27,000 customers make their homes and businesses more entertaining. Charles N. Bock, Sr. opened the original Stereo Barn in Ephrata, Pennsylvania. In 1989, his son Charles H. Bock opened Stereo Barn’s first Berks County store right across from the Berkshire Mall in Wyomissing. Charlie and his wife Patti co-own the Stereo Barn. Today, we work out of Sinking Spring, PA and serve our customers throughout Pennsylvania. When we first began, we were just a stereo shop. Now, over 95% of our business involves custom installing entertainment systems that we design. WE WORRY ABOUT THE PRICE SO YOU DON’T HAVE TO. At Stereo Barn you will pay the same price or lower than the big box store or authorized internet dealers. WE GUARANTEE IT! WE KNOW A LOT. Our advice is priceless, and we don’t charge for it. When you make a purchase at Stereo Barn, you have the support of a group of professionals with over 100 years of experience in the industry. OUR INSTALL TECHNICIANS ARE THE BEST. Our installation technicians are highly-trained and knowledgeable experts on audio and video components & systems. They are the kind of people you want in your home. WE SERVICE WHAT WE SELL. We stand behind the quality of everything we sell. Since 1971 Stereo Barn has offered service for any item we have ever sold. You’ll never have to guess who to call when you have a problem. WE HAVE BEEN AT THIS FOR 47 YEARS AND COUNTING. – Since 1971, Stereo Barn has been family owned and operated by the Bock family. Being locally owned, we are a community-oriented company, supporting local charities and non-profits including the Reading Symphony Orchestra, Berks Catholic Extravaganza, Olivets Boys & Girls Club, & Wyomissing Public Library to name a few.